AC Milan face Napoli on Saturday night as they kick-start their Serie A campaign in a difficult clash against Carlo Ancelotti’s men. The Rossoneri saw their season opener against Genoa last weekend postponed due to the tragedy in the city when a bridge collapsed, and so they had to put their preparations on hold. In turn, the trip to Naples will now serve as the first glimpse of them in action this year, with Gattuso undoubtedly hoping that they are able to get off to a positive start in their pursuit of a top four finish in Serie A this season to qualify for the Champions League. Much to the frustration of some fans though, as seen in the tweets below, it’s suggested by Calciomercato among other outlets in Italy, that Fabio Borini could be in line for a place in the starting line up. The issue stems from the fact that Hakan Calhanoglu is suspended and therefore leaves a question mark over who will play on the left wing in Gattuso’s preferred 4-3-3 system. While Giacomo Bonaventura has played there previously, summer signings Samu Castillejo and Diego Laxalt are capable of being deployed in that role too. However, the report claims that Borini is expected to get the nod for Milan, despite the fact that he regularly struggled to have a positive impact when played in an advanced attacking role last season. The 27-year-old did score five goals and provided seven assists in 44 appearances last year, and while his work ethic and sacrifice for his teammates should be lauded, it’s questionable as to whether he should be an important part of an attacking trident in such a big game. 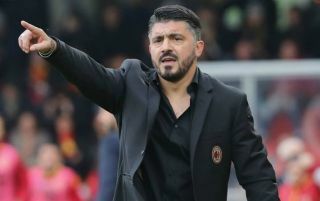 Time will tell though if Gattuso is right to show faith in him over the other options at his disposal, provided he does start, as he seemingly believes the new recruits aren’t quite ready. Would be absolutely dumbfounded if Gattuso actually starts Borini tomorrow. That mid 3 of Baka – Biglia – Kessie our best shot, physically, w Jack giving service up the wing. I like Borini’s work ethic, and his… actually just his work ethic. Other than that he is about as talented a football player as a concrete brick. In no way, shape, or form is Borini Milan worthy, especially with Laxalt and Castillejo in the team. I believe in Genaro but why Borini!!!!!!!!!!!!!!! !